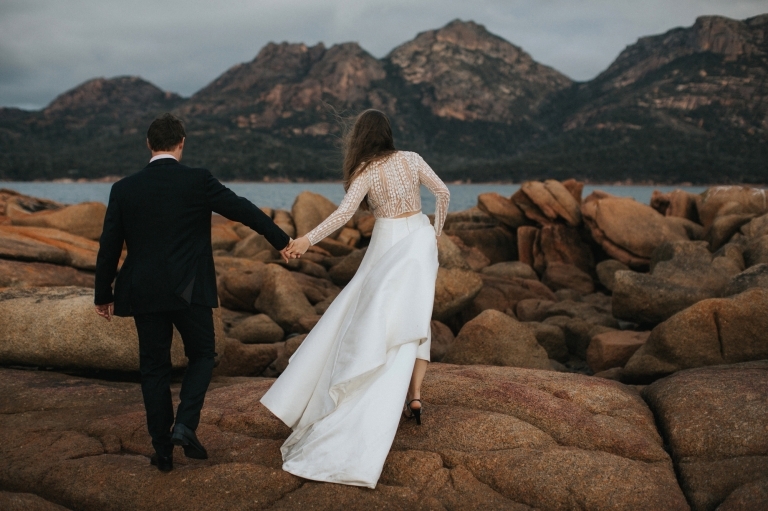 An adventure to the East Coast, Tasmania Wedding Photography. Emily and Andrew are adventurers at heart and decided to make the most of Tassie after their MONA wedding (coming to the blog soon). 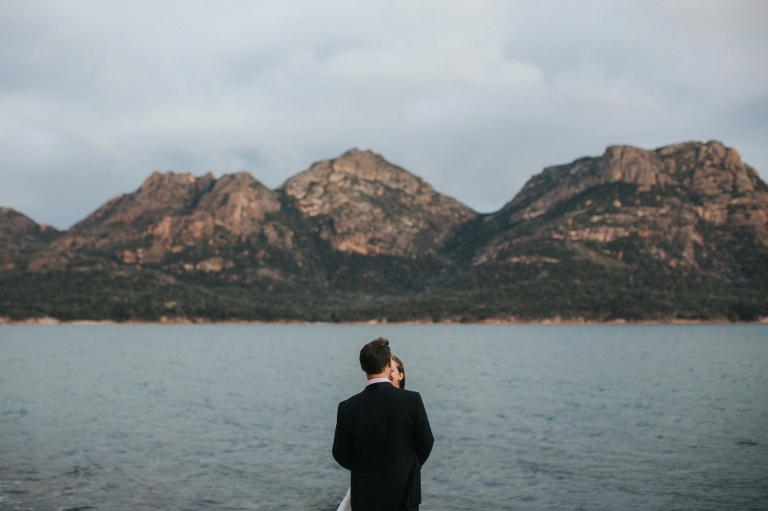 A few days after the big wedding day I met them at Coles Bay on Tasmania’s stunning East Coast. The East Coast of Tassie is a little less wild than the West but holds it’s own in beauty, especially when the sunset lights up the landscape like it did while we were exploring the bay. Why take portraits on a different day to your wedding? Designed for couples who are up for a bit more exploring, especially in Tassie. There is just so much to see and share and when couples are coming from interstate or overseas, I get super excited to take them to some of my favourite locations. Even if that does mean battling colder weather, leeches or climbs, the mood is there to be captured in the wind, the oceans, the canopy of ferns. 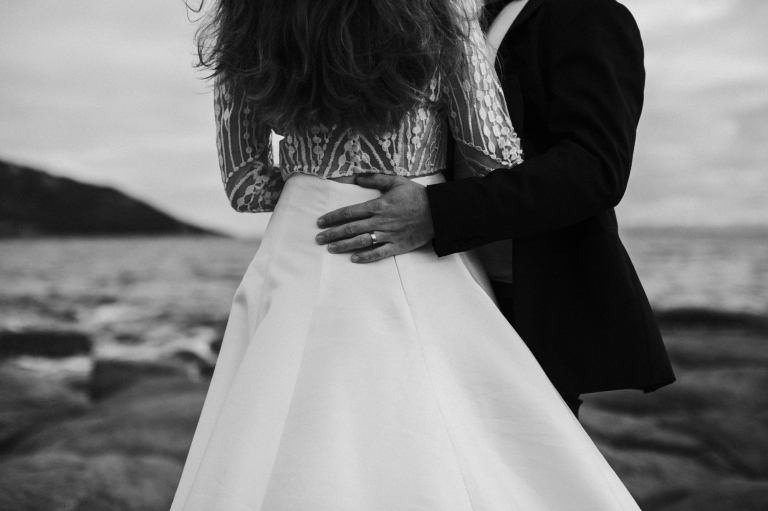 Doing this after your wedding day means you can relax into it without worrying about time or your dress getting dirty or your hair getting wet etc. It also means you can be out and about in the perfect light without missing half of your reception. Mostly it’s just loads of fun. This particular East Coast, Tasmania Wedding Photography session saw us catching up mid week after Emily and Andrew had had a few days to relax into their honeymoon. They’d spent cold nights in front of a soul warming fire with Tassie wine and food and felt energised and ready to explore. We scrambled over rocks and followed the ever changing light around whilst chatting and reliving the wedding day. It’s a beautiful way to have photo’s taken, almost like you’re not having them taken at all, just having fun and wandering around in your wedding get up! If you’re keen to ask me all about it!